Welcome to Broadway! Your tour guide: homicide detective Danny Clover (Larry Thor). He holds his exhaustion, evident in his haggard and tremulous voice, in check - knowing full well that his dangerous dealings with the underbelly of the Great White Way will begin again come the dawn. Supported by his colleagues - the paternal, precinct-based Sergeant Gino Tartaglia (Charles Calvert) and field investigator Detective Muggavan (Jack Kruschen) - Clover's work takes him to the Bronx, Spanish Harlem, Central Park, the Chelsea docks, Greenwich Village, Coney Island and all over New York City. The cases presented here were produced and directed by Elliott Lewis, written by Morton Fine and David Friedkin, and performed by Betty Lou Gerson, Howard McNear, Frances Robinson, Paula Winslowe, Richard Crenna, William Conrad, and more. 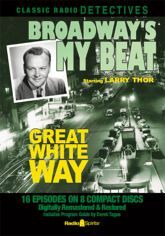 Includes 16 digitally restored and remastered episodes, and a Program Guide by Derek Tague.